The Small Firms Loan Guarantee scheme was introduced to help businesses that could not initially gain funding through traditional lenders. The scheme works by obtaining a guarantee from the government that will cover around 75% of the loan amount should any problems occur with repayments. However, there are certain stipulations to the scheme that businesses should be aware of. Small to Medium sized businesses that are just starting up can run into trouble when they apply to lenders for funding. Most banks and building societies will lend but they will usually require security in the form of property or business assets. For some small businesses this can be a problem and can often be the main reason they are ineligible for financing. Many small businesses can find loans from other sources but without the appropriate security the interest rates can be extortionate. The Department for Business, Enterprise and Regulatory Reform (BERR) runs the Small Firms Loan Guarantee with a number of reputable lenders. By providing a guarantee for three quarters of the loan the risk is reduced for business lenders. This guarantee will cost businesses two percent each year, and it is two percent of the outstanding loan amount. This two percent has to be paid directly to the BERR each year. The two percent is an addition to the interest payable on the actual loan. In many cases the total interest will be less than the interest rates for unsecured loans from other lenders. There are a number of business and industry restrictions that do come with this loan guarantee. Business restrictions will include betting and gambling establishments, self-employed artists and musicians, commission agents and insurance businesses. Other businesses that are not eligible include fisheries and forestry agents, ticket agents and certain medical businesses. A full list of those that are ineligible for the scheme can be provided through the Department for Business, Enterprise and Regulatory Reform. The Small Firms Loan Guarantee scheme will provide security on loans up to a limit of £250,000. The loans must be repaid anywhere between two and ten years. The loan interest rate will depend on the lender, but interest terms should be reasonable with the guarantee involved. There is a wide range of lenders in Scotland, England and Wales that do use the Small Firms Loan Guarantee scheme. A list of lenders is available from the BERR website. There are a number of banks that do lend in conjunction with the Small Firms Loan Guarantee scheme but they will not usually broadcast this fact. One reason for this may be that these loans are usually provided to businesses that cannot obtain funding elsewhere, meaning they may be a bad credit risk. Although the loan scheme guarantees some of the loan, it still means there is a risk for the lenders. 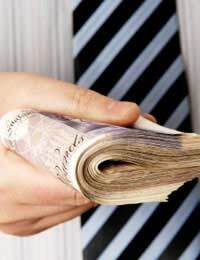 It is estimated that around half of the loans taken using the Small Firms Loan Guarantee scheme are never repaid. This means that lenders will need to write off part of the loan; this is not too much of an incentive for the lenders. Small or medium businesses that are finding financing difficult to obtain should consider the Small Firms Loan Guarantee scheme. The scheme can work out cheaper with regards to high interest rates that will be applied by “no security” lenders. Full details of the scheme can be provided through Enterprise agencies or the BERR. Always compare all of your financing options and shop around to obtain the best interest rates possible before signing any contract.